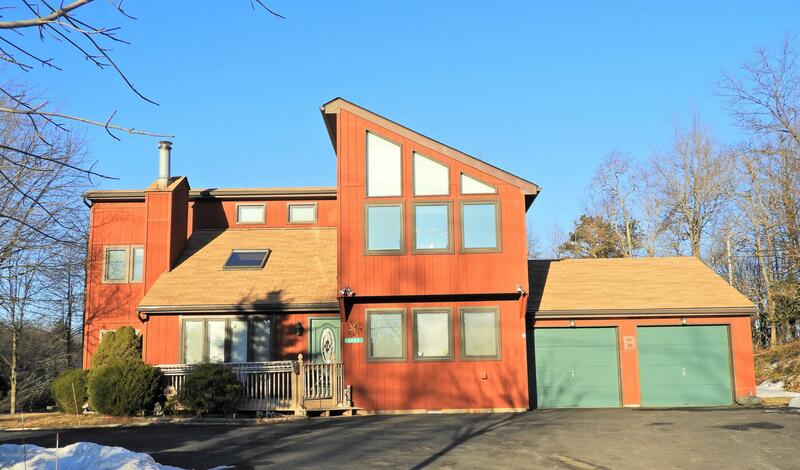 Remarks: SPECTACULAR LAKEFRONT CONTEMPORARY with Private Dock & Lake Views From BOTH Front & Back. MANY recent upgrades & improvements throughout. BRIGHT & OPEN layout with Living Room with CATHEDRAL CEILINGS, SKYLIGHTS & STONE FIREPLACE flowing into Remodeled Kitchen with GRANITE counter & island with cooktop. STAINLESS STEEL appliances & NEW fixtures. Dining area & Family Room have slides to oversized deck. 3 LARGE Bedrooms including MASTER SUITE with laminate floors, CATHEDRAL CEILINGS & tiled Bath Suite with JETTED tub & Separate Shower. Baths have been upgraded. Roof is JUST 5 years old! 1 Car garage. Located just MINUTES to Camelback, Kalahari & Mt Airy Casino. MUST SEE! !